We are one of the leading Spinning Frame Bobbin Holders and Finger Brakes manufacturer. In our design our Bobbin Holders holding and releasing the roving Bobbin (creeling and decreeling) system in full guaranteed Bobbin Holders is fully guaranteed for Locking and Unlocking of the roving Bobbin by its definite design. Simple ratchet mechanism ensure the reliable operation of the roving Bobbin. Non Rotating Bobbin Holders can swing (tilt) as rotating Bobbin Holders and Locking and unlocking hitting will not cause any damage to the Bobbin Holders. The ratchet mechanism is well designed with special grade stainless steel ‘Z’ spring which ensures trouble free operation in load and unloading of roving bobbin, it also with stand variable load applied during loading of the roving bobbin. As you are fully aware that the Bobbin Holders are the most critical item in the Spinning mills operation. To avoid any working problem during the production, the leading mills are selecting starplus Bobbin Holders for its trouble free Design. Bobbin Holders Rotating Type offered comprise quality finished and high performance based stock of fly tying tool bobbins holder. 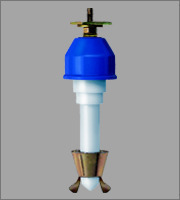 Bobbin Holders Non Rotating Type offered is available in Teflon-coated construction finish.